We had a busy, but relatively low-key (can that happen?!) Easter weekend! 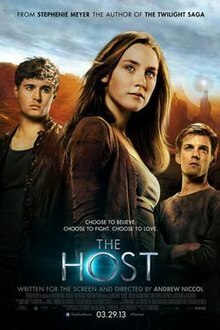 Afterwards, we went to see The Host. It was a little odd, but I liked it more than I thought I would! On Saturday, I ran ten miles (not really sure why) and then realized why I never do yardwork! Two trips to Lowe's and almost four hours later, we pulled up the dead-looking rose bushes in the front of our house and we planted some dianthus in its place. Side note: I have noooo clue what dianthus is; I wanted petunias, but all of the petunias at Lowe's looked awfully close to dying, and I do not have a green thumb to try and save them! All I know is that you do not have to replant dianthus every year = awesome. After this whole ordeal, Travis will be lucky if I ever do yard work again! Just look at my hands! YUCK! I am so not an outdoor girl! Phew...for the record, there are TWENTY ONE little dianthus plants along our walkway now. That's right...I dug 21 holes. And I kept screaming because there were lots of worms involved. It was revolting. Sunday morning, we woke up to our Easter baskets from the Easter Bunny me! Funny how he knew just what to buy....wine, beer, Peeps and chocolate! Our faves! We went to church, where they had beautiful flowers! The sanctuary smelled so good! After brunch, we spent the remainder of the day still recovering from our extensive yard work (I may or may not have taken a two hour nap) and watch my brackets further deteriorate. I don't even want to talk about that. Alright friends, I'm off to tackle more of my spring break to-do list!